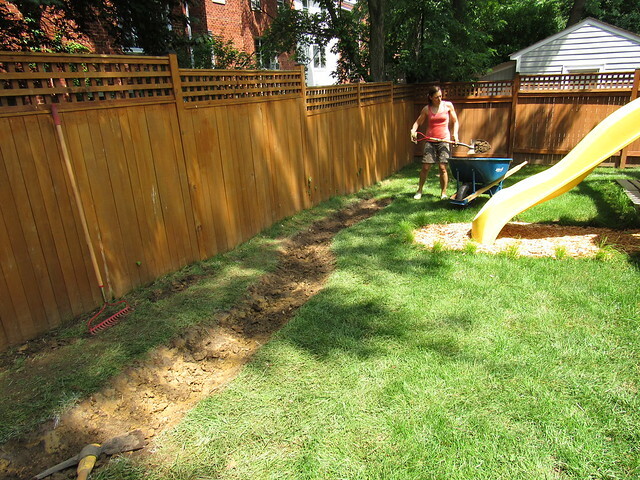 When we moved into our house three years ago, the backyard was pretty much a blank canvas. We always knew we wanted something different but turned to interior and front yard projects first. 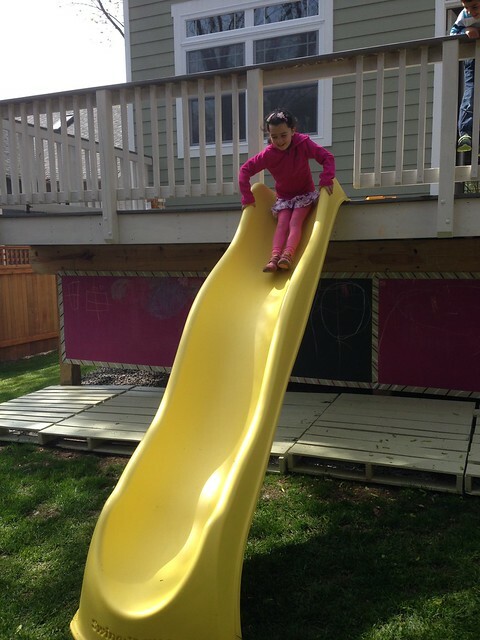 Last year we added a slide, a rope ladder and some chalkboards to make it a little more attractive for our children. This year it was finally time to direct our energies towards the back yard. We decided to call a professional designer to help us turn our ideas and vision into a plan. The space is not large, but consists of various areas which we wanted tied together in a meaningful, aesthetic and useful way. We searched high and low for the right person and came across Beth Ginter of The Honeybee Group in Silver Spring, MD. 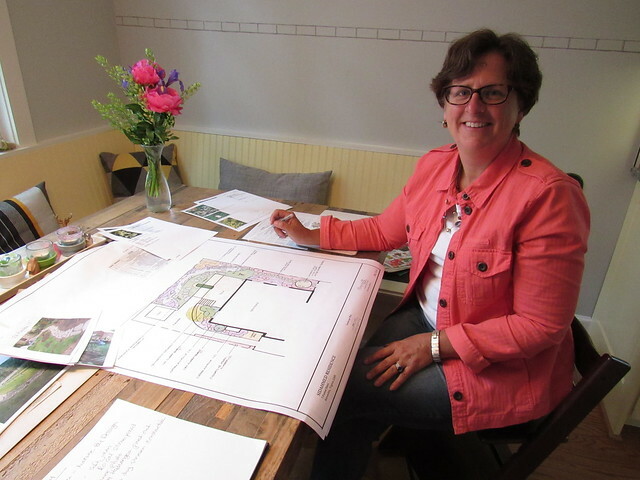 She turned out to be exactly what we were looking for in a designer — with an emphasis on sustainability and use of native plant material and a lot of experience in creating versatile outdoor spaces for families. Beth incorporated all our visions and needs into her design and delivered a plan which allows us to do the work in stages (in all, the project may take a year to complete). 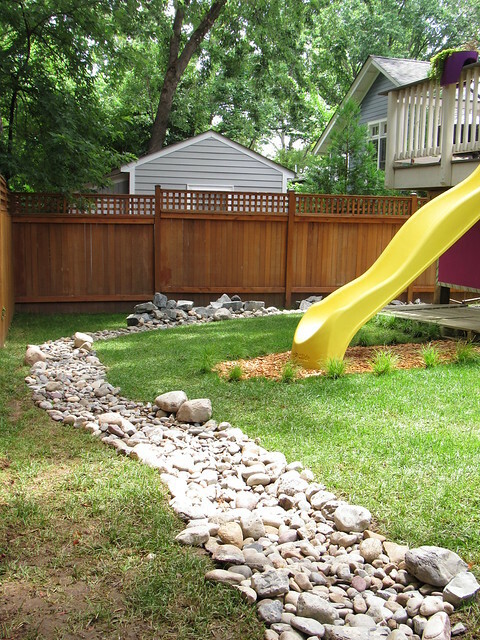 First up: A 50-foot long dry creek to help with drainage but also to add visual interest and invite the children to play. 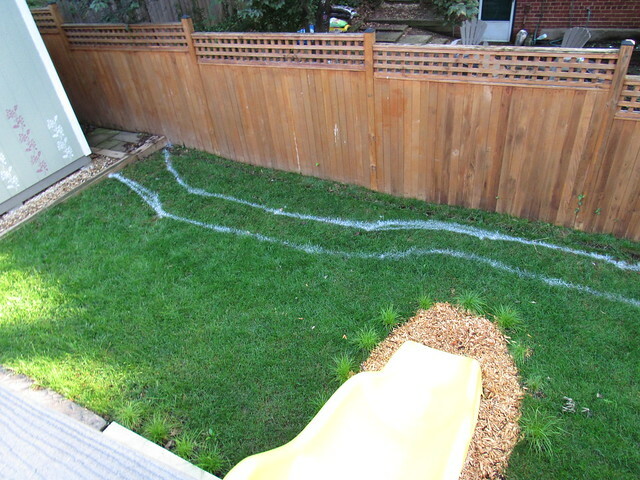 We outlined the area for the creek according to Beth’s design using chalk spray. Then the digging began. We excavated to a maximum depth of 8 inches while making sure to create angled sides. 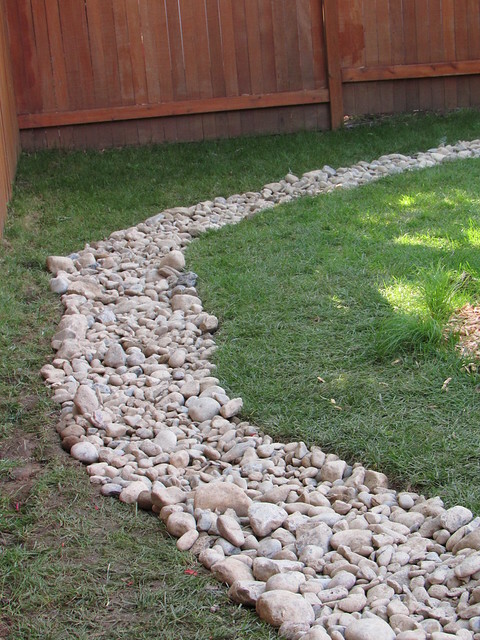 After tamping the ground firm we lined the entire surface with landscape fabric and filled it with river jacks, using a mixture of 1 x 3 and 3 x 5 inch rocks. 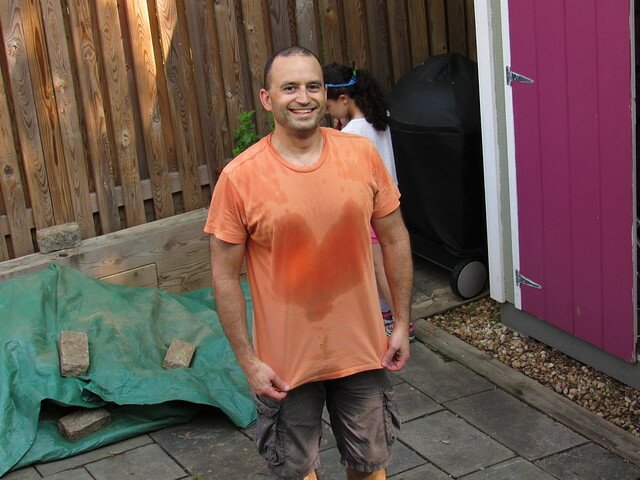 We managed to finish the digging and filling in one long and sweaty afternoon. I got all the stones at Sislers Stone in Falls Church. 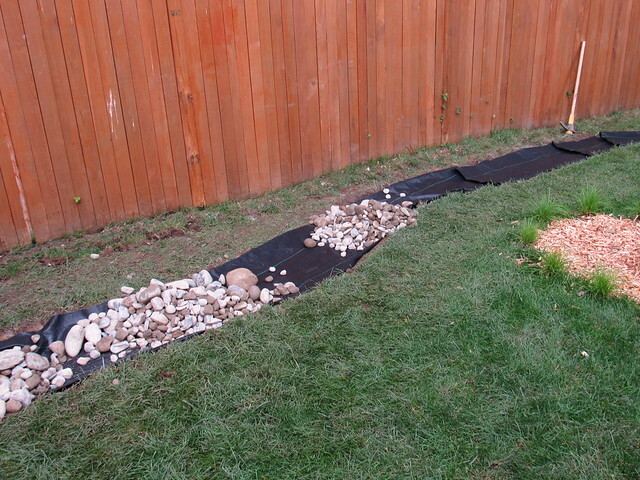 I called five different stone yards and Sislers had by far the best pricing, especially delivery costs. When I visited the stone yard at Sislers, everyone was very helpful and knowledgeable. 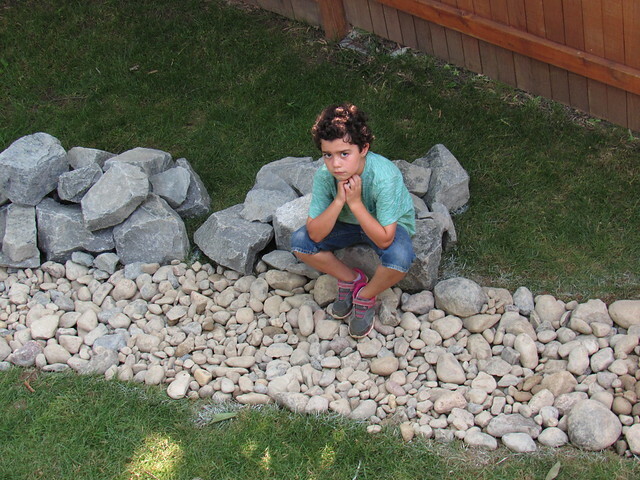 It worked out well for our needs and the children immediately identified their favorite rocks along the creek. 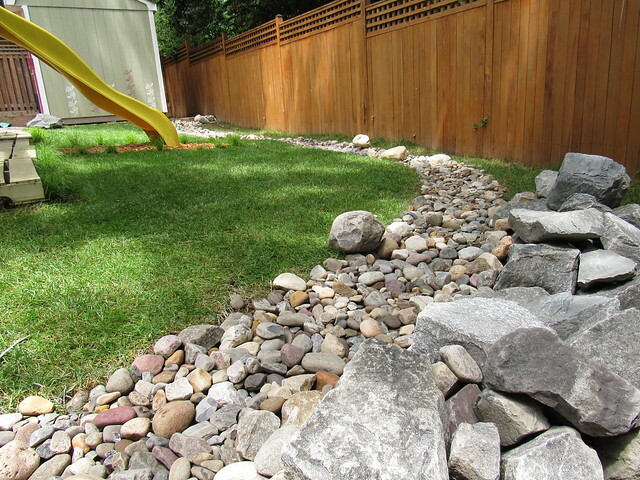 Placing the rocks turned into a family project with everyone working up quite a sweat as we chose to do this on one of the hottest weekends so far this year. We are thrilled with the result of our work, but are still adding some final touches like sparkling glass gems and glow-in-the dark paint. I’ll be back for part 2 after we fill the area between the creek and the fence with a lush variety of native plants: hydrangea, viburnum, fern, aster, sedum, and phlox as well as install a magic children’s circle. Very fun, looking forward to seeing the next phase!